Did you know you can get a two course Thai meal and a soft drink for just £10, in the heart of Newcastle? 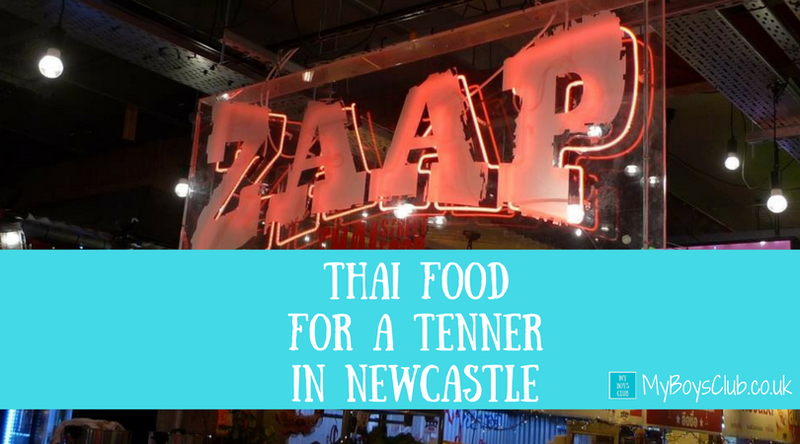 The Zaap Thai restaurant, located on Newgate Street in Newcastle, in the building that formerly housed the COOP deparment store, offers such a deal on weekdays between 11am and 6pm. 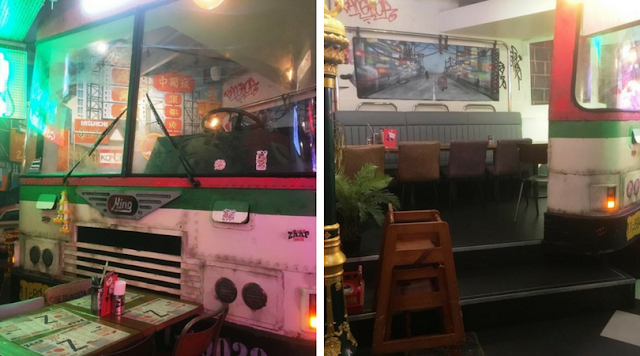 We were recently heading to the theatre for a show at the newly opened Alphabetti Theatre and wanted grab some food before we arrived. After a quick check on new places to eat we decided on Zaap Thai. We’d quite fancied going for a while and just hadn’t made it yet. But being fairly close to the theatre we decided to give it a try. We did cut it fine a little after being stuck in traffic. After parking for free - thanks to Alive After 5 - in the car park next to Dance City, we arrived at around 5.55pm but we were still good for the deal. Phew! Located outside the Gate, just next to Chinatown, Zaap Thai is designed like a Bangkok street food market, with all its magical hustle and bustle, neon lighting, funky tuk-tuks, a bus (yes a bus) and, of course, Thai street food on the menu. There are over 80 authentic Thai street food dishes on the menu, leaving us plenty to try on our next visit but on this occasion, it was all about the Thai Food for a Tenner deal. We decided to try both starters and share. They were tasty, a decent size portion and equally as nice as each other. I'd happily eat them both again. Both of these could be made either chicken or vegetarian. We chose a different dish each, both made vegetarian with the plan to share these too. However we each loved the one we picked that much we didn’t really share these ones! Both were delicious though. The curry was my favourite but for hubby, it was the sweet and sour. Hubby went with a Coke but I decided to try an Oishi Ice Tea. I hadn’t heard of it before, never mind tried it but I’m glad I did. It was so delicious. Trying to describe the taste. Very sweet, but not too sweet. It apparently gives you the full black tea health benefits mixed with lemon that will give you the energy you need for the day. Tastes great and does you good. I’d definitely drink it again. For £10 per head, this is such a good deal. And to be honest it is worth a lot more. It makes for a great frugal date night or a family meal out. 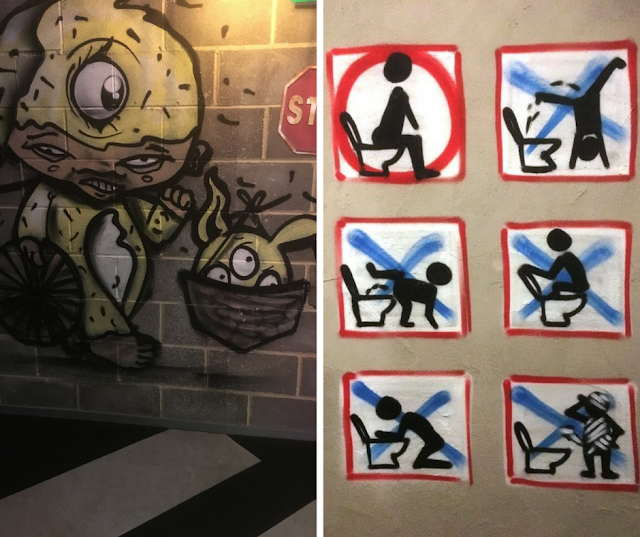 The food was very tasty and of a hight quality, the service spot on, and the surroundings were quirky in a good way - make sure you visit the toilets on your visit to see the wall art. We’ll be back to try out more of the menu soon – maybe taking the boys next time. They would love the tuk tuks.